Live penguins, dead alligators, sausage, doughnut glaze and fake blood: these are just a few examples of the bizarre cargo that has been spilled onto America’s highways during accidents involving tractor-trailers. No one was hurt in these bizarre crashes but that’s not always the case. If you’ve been injured in an accident with a truck that wasn’t your fault then you may want to visit someone like this Odessa truck accident attorney. Usually, truck accidents are quite serious with some truck drivers finding themselves being blamed for the accident and any personal injury that has happened, if you are a truck driver and you have found yourself being charged with an accident you might want to find someone like this philadelphia criminal lawyer who might be able to help with your case. However, there are some truck accidents that we hope you see the funny side to. As the following 15 bizarre truck spills show, you truly never know what’s concealed inside that semi truck riding alongside you on the highway. Imagine walking along a sidewalk, going about your day, when suddenly you find yourself covered in rotting whale blood and guts. 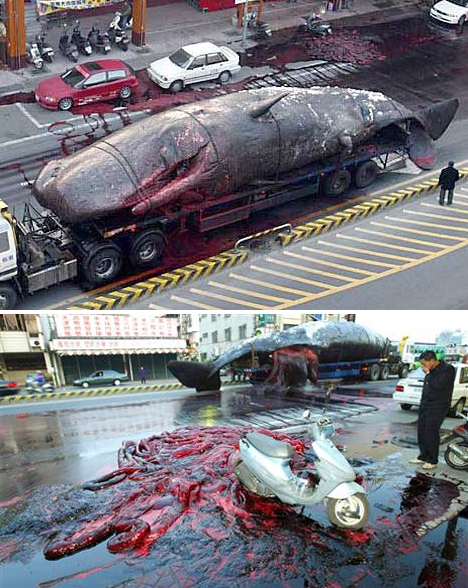 In 2004, residents of the Taiwanese city of Tainan got quite a surprise when a whale carcass, being transported from the beach where it died to a biology laboratory, exploded – sending tons of gory, disgusting whale entrails all over the street. The explosion was blamed on pressure from gases building up as the whale decomposed, and it took 13 hours, three large lifting cranes and 50 workers to get it cleaned up. 25 penguins, an octopus and some exotic fish were minding their own business in the back of a refrigerated truck while being transported from the Indianapolis Zoo to Moody Gardens in Galveston, Texas when suddenly, they found themselves on the side of the highway. The truck driver had lost control, flipping the truck several times before it ejected its unusual passengers. Sadly, four of the penguins died, but the octopus and fish were thrown clear and found alive in their plastic bags. Where’s the beef? Well, on October 26th, it could be found scattered all over the Massachusetts turnpike after an accident involving three tractor-trailers. Those into eating raw meat even had plastic cups waiting for them to scoop it up with, as they, too, spilled from another truck involved in the accident. Yet another truck was filled with tomatoes, but those stayed inside, preventing one big batch of gritty, extremely rare beef stew. A deer darting into the highway created quite a sticky situation in Wagontire, Oregon in 2008. 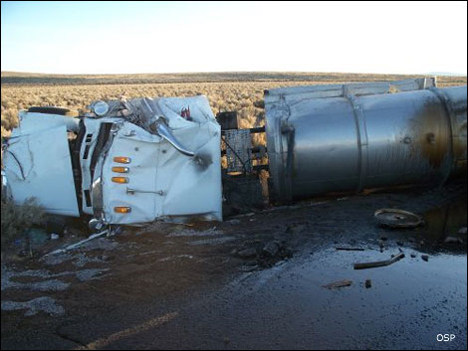 The driver of a truck hauling hundreds of gallons of molasses swerved, crashed, and sent the goopy substance gushing all over the road. State police say the non-hazardous material caused very little environmental impact, and it took just about three hours to clean up. Molasses might be sticky, but it’s got nothin’ on glue. Firefighters in China had a hell of a time cleaning up a highway after a truck loaded with buckets of construction glue crashed into a bus in Chengdu City. They tried using water guns to dilute the glue without success, and it didn’t take long before their spades and brooms became mired in the mess. Onlookers even slipped and got stuck. Eventually, the glue was dissolved with special chemicals. There’s nothing like getting stuck in a major traffic jam early in the morning and being forced to smell breakfast meat the entire time. 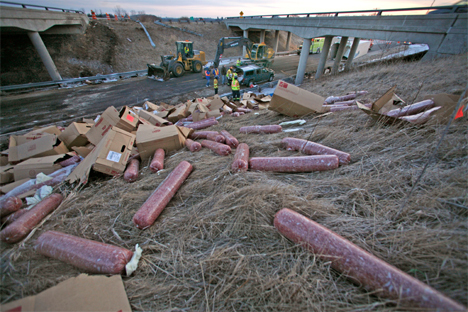 That’s what happened in Wisconsin last March after a two-truck crash left 40,000 pounds of sausage strewn all over the road. The highway was cleaned up after a few hours, but much of the sausage spilled onto an adjoining road, which probably stunk for some time. Synthetic blood is probably among the last things you’d guess would be inside a tractor trailer riding alongside you on the highway, but as evidenced by this crash, trucks full of fake blood do indeed exist. 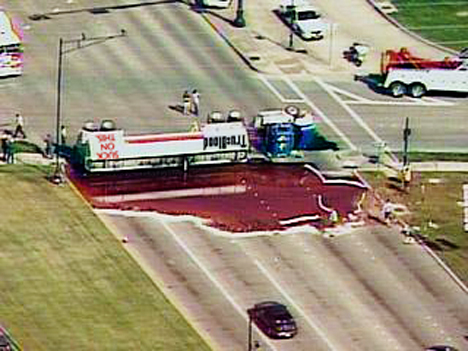 A big rig carrying about 8,000 gallons of synthetic Japanese blood known as Tru Blood hit a curb and jack-knifed in Sugar Land, Texas in 2008. But of course, fake blood smeared across a highway is nowhere near as disgusting as the real thing – and that has happened, too. 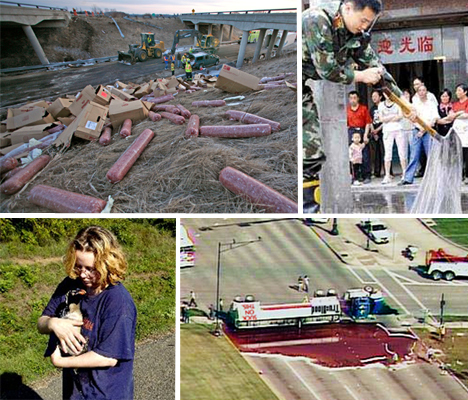 In Oregon in June 2007, a valve broke on a truck hauling animal waste from a processing plant, sending 4,000 gallons of pig blood gushing forth onto the road and into the yards of nearby homes. 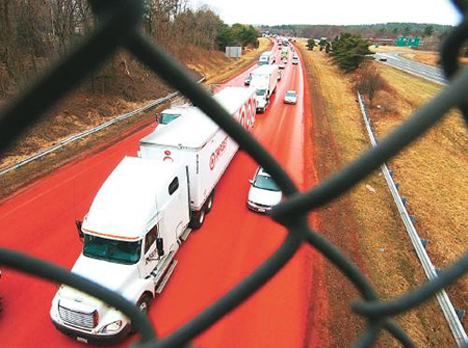 It’s not blood, but it still made quite a startling mess: red-orange iron oxide dye, staining a stretch of highway in northern Massachusetts for days. The dye was meant for coloring mulch, but it never quite made it to its intended destination, instead splattering the dye all over the road, where it was spread by traffic for three miles. 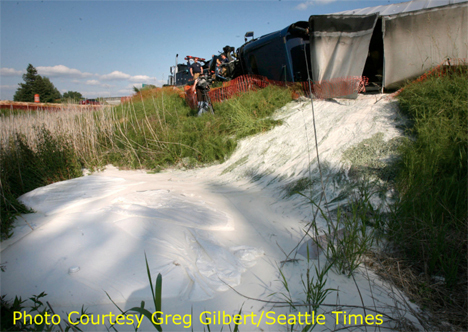 What do you get when you combine a truck full of powdered milk and a drunk driver? One extremely bizarre highway spill. 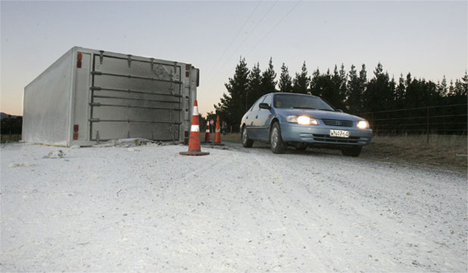 The milk powder looked like freshly fallen snow on the New Zealand highway after the intoxicated truck driver crashed and skidded the truck’s trailer for nearly 500 feet. Luckily, the trucking company was able to sweep it up before it rained and gave the entire area that gross sour milk smell. In Cleveland, a pungent smell of rotting animal entrails and other byproducts met commuters one January morning in 2008. “Anyone who drove by the scene will tell you, the smell is putrid,” said a local reporter. 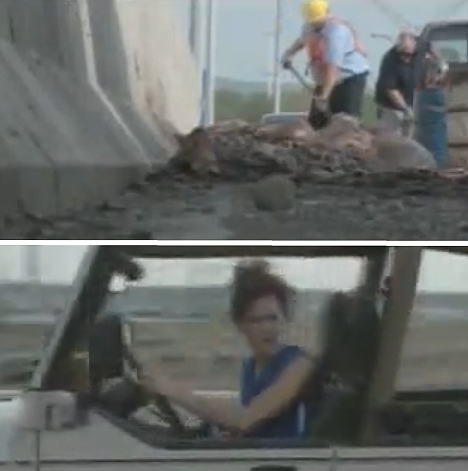 A local news station captured the hilarious reaction of drivers as they passed the scene of the accident, gagging at the stench emitted by the animal remains that were being scooped up by workers into trash barrels. Emergency crews responding to a major accident in Salt Lake City, Utah last February got quite a surprise when they arrived on the scene only to find thousands upon thousands of hamburger patties littering the road. A truck driver hauling 40,000 pounds of the burgers fell asleep at the wheel, causing the semi to strike the center divider and split open. 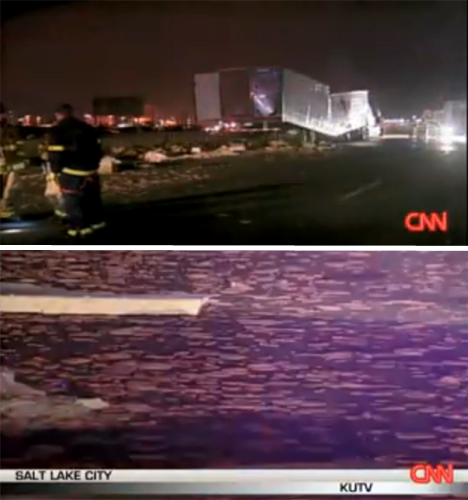 Strangely, just a few hours earlier, another truck spilled a load of beer onto a nearby highway. 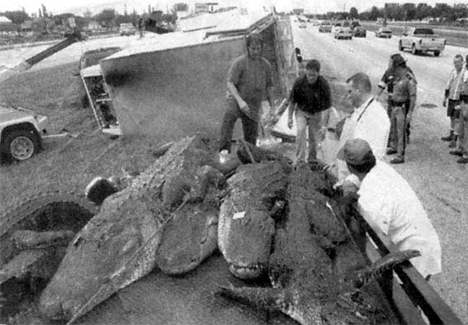 On a Fort Lauderdale highway in October 2000, a tractor-trailer that was carrying 26 dead alligators to a processing plant overturned, spilling the carcasses all over the road. The gators were due to be skinned and butchered, accident or no, so the workers simply hauled them up onto a flatbed truck and continued on their way. Pastry fans lamented the waste of hundreds of gallons of donut glaze, which poured out of a truck that turned over on a highway in Seattle. A giant pool of the sticky, sweet mess collected in a culvert and had to be cleaned up by the State Department of Transportation. Millions of angry bees have spilled onto highways no less than three times in the last several years. In Montana, 9 million bees spilled onto a highway along with hundreds of hives and lots of honey, while Canada saw a honeybee spill that unleashed 12 million from an overturned truck. 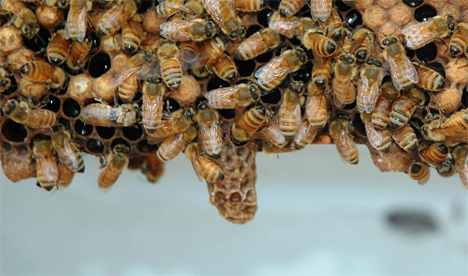 In California, 10 to 16 million bees were accidentally released and proceeded to sting responding firefighters, police, and even drivers that were stuck behind the accident. 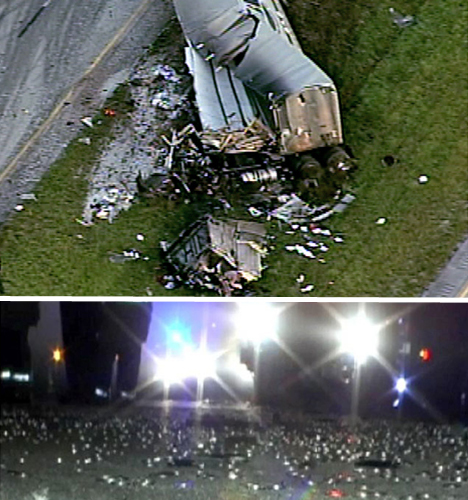 A big rig carrying freshly nickels from the U.S. Mint in Philadelphia to the Federal Reserve in Miami crashed into another truck in Brevard County, Florida in 2008, spilling $185,000 worth of coins onto the highway. 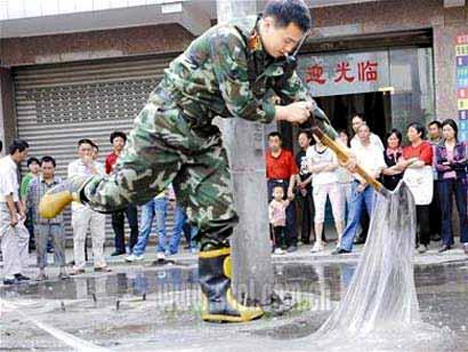 3.5 million nickels sparkled in the sun like glitter, and cleanup crews had to use blowers and shovels to clean them up.